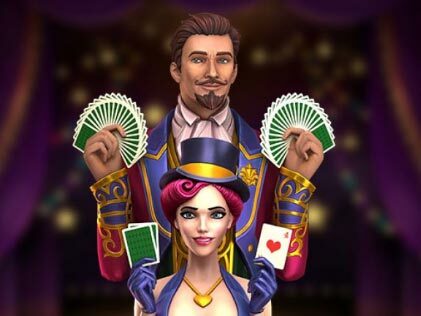 Featuring the backdrop of a magic show, Foxium Gaming Software launches a slot that revolves around the master of magic – The Great Albini and his assistant Lily also referred to as the Aztec Lady. Enter this magical show replete with illusions and majestic animations with the audience eagerly waiting for Albini to weave his magic. 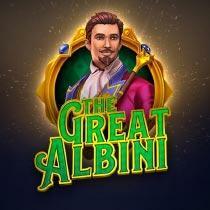 A 5*3 slot in the base game with 25 fixed paylines, the Great Albini slot is Foxium's first release in 2019. This video slot is jam packed with incredible features including sticky Aztec lady feature, magical box feature and free spins that allow players to score big wins worth up to 4000x your stake! Should you decide to enter the magical world, read this unbiased review to know all the features in detail with an option to play this incredible slot for free via the demo version given below. This Slot Game is played with different pay lines in different modes. 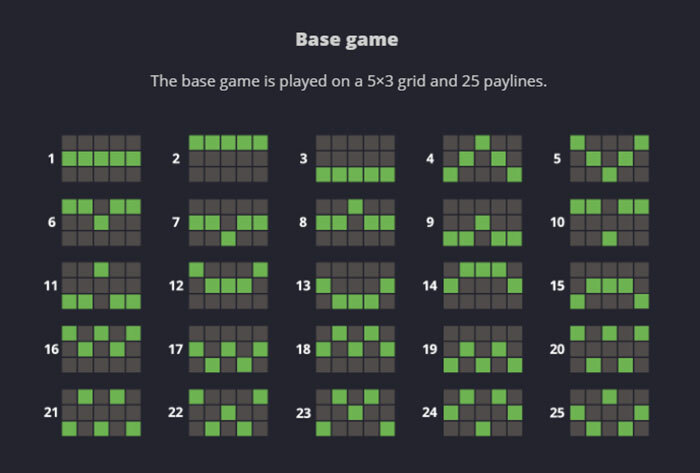 During the base game, this online slot is played on a 5*3 grid with 25 paylines. 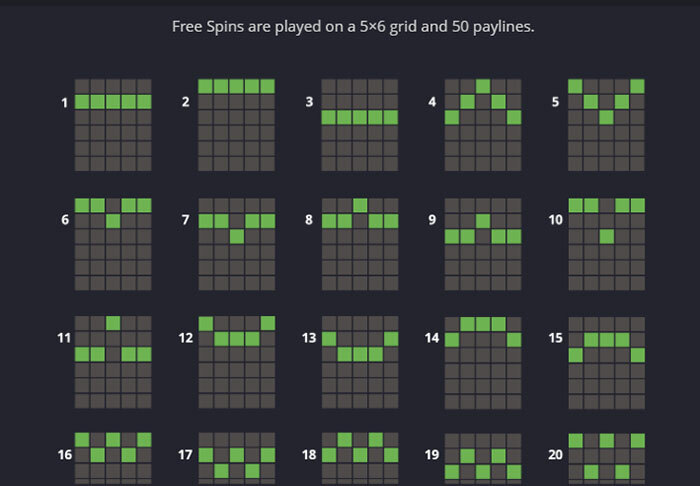 Whereas, for the Free Spins mode the Great Albini Slot game is played on a 5*6 Grid that consists of 50 paylines. Players can use the Bet Selector button to adjust the required bet level. Matching symbols form winning combinations. Winnings are paid out in accordance to the pay table. Only the highest win per bet line is paid out. How to Play The Great Albini Slot? Bet – This field allows you to set your preferred bet amount. Various denominations starting from 0.25 to 50 are available per spin. You can either use the arrows available on the right hand side or simply click on the field which opens all the bet values available. Spin – Use the spin button which is a circular arrow available at the bottom right to start the game round. Alternatively, you can also use the space bar to spin the reels. Using this, the reels are set into action at predetermined denominations. Game Information – Use the '?' to open the game information and displays the game rules, various bonus features, bonus rounds, game controls etc. The above mentioned features have been briefly explained under this section. Autoplay – Using the Autoplay options, you can spin the reels of The Great Albini Slot uninterruptedly for a fixed number of rounds. The advanced settings allow the player to set the bet level, loss or win limits as well as the number of free spins a player wants to run. Sounds – Using the sound icon, you can mute or unmute the volume via the quick button. To adjust the volume, use the main menu. Game Credits – This section displays the total balance you have. You can view your balance at the bottom left side of the screen under the head – Balance. Stop Button – The Spin button switches to a Stop Button when the reels start moving. The button looks like a rectangle with round edges and helps display the result of the spin quicker without effecting the results. Free Spins Gifts – The bonus box allows you to buy 8, 10 or 12 Free Spins at 100x, 125x and 150 times your current bet. Buy these free spins and trigger the respective number at the bet level you purchased them at. Information – The 'i' on the left hand bottom corner helps the player to see all the fixed paylines and different segments to access the sounds, bet level and game settings. This section also consists of a brief description regarding the various features found in the game. Visually appealing, the slot launches itself with an introductory video where just right outside a theater are people gathered waiting to watch The Great Albini Magic Show. Then suddenly amidst a puff of purple smoke appears the man himself – Albini. The excited audience applauds when Albini swirls his magic stick and performs. Then comes his companion, Lily and together they get on the stage. This slot game exhibits impeccable graphics where the background is static and is an on stage set up that includes heavy drapes, nominal lightning and Albini standing on the left with a magic Scepter (cane) in his hand. The soundtrack is pleasant and adds the necessary suspense which amplifies on every win with Coins flying up in the air. Overall, the graphics, sound and looks adds to the entire appeal of this slot. Standard Reel Symbols – The High Paying symbols include the main characters of the magic show namely – The Great Albini himself and his beautiful assistant Lily. A canary, a Knife dart board and some lucky cups form the Medium Value Symbols. Meanwhile, at the lower end, card suits from 10, J, Q, K and A constitute the Low Value Symbols. Wild Symbol – This symbol is represented by a block with the word Wild written across it in yellow. The symbol only appears on reels 2 to 5 and replaces all other symbols except The Free Spins symbol, the Mystery Box symbol and Lily Wild symbol. Bonus Symbols – This slot game is loaded with multiple bonus features and are represented by different symbols. The Mystery Box symbol is symbolized by a green wooden box with a '?' marked on it. The Free Spins Symbol is a poster featuring the Great Albini and Lily whereas the Lily Feature symbol has Lily standing on the stage. This symbol is an expanding wild and covers the entire reel is triggered. The mystery box respin feature is activated when an entire stack of mystery boxes land on the middle reel or the third reel to be precise. After the mystery boxes are locked in place, 3 respins are awarded. Until this feature ends, any additional mystery boxes are also locked in place where the count of respins is rest to 3. The feature continues until the entire reel area is filled with Mystery Boxes or when no more mystery boxes land on the reels. Once the respin is complete, the mystery box reveals a random symbol except for the Wild Symbol and the Free Spins symbols. Any lines wins are paid out depending on the symbol payout that replaced the mystery boxes. The Mystery Box feature can only be triggered during the base game and is played on the same bet level as the round that triggered this feature. During this feature, the game grid expands to become a 5*6 grid with 50 paylines as opposed to the regular 5*3 grid that has 25 paylines. Should you land the Free Spins symbol anywhere on reels 2, 3 or 4, the free spins round will be activated and shall award 12 Free Spins. Alternatively you can also use the buy-in feature to purchase 8, 10 or 12 free spins on a predetermined price. The Free Spins symbol is a 3x3 symbol block that fully covers the reels and is represented by a poster displaying the main characters of the Great Albini Magic Show. These Free Spins are played on the same bet level as the round that triggered it. This round can not fetch any additional free spins and continues until no free spins remain. To activate this feature, the Lily Wild symbol must land on the reels 2 to 4 where it covers the entire reel. Under this bonus feature, the lady luck is on your side for all the wins are doubled and the respins only stop when a non winning spin occurs. The Lily Wild symbol is locked during the respins and functions just like the wild symbol. This symbol awards free spins and only one Lily Symbol can appear on the reels simultaneously. The Bonus Box Feature allows you to purchase free spins and functions just like the Free Spins round triggered organically. You can select to buy 8, 10 and 12 free spins at a fixed price of 100 times your bet, 125 times your bet and 150 times of your bet respectively. Furthermore, this feature can immediately trigger the Free Spins round followed by the Lily Feature. The Great Albini Slot is the joint product of Foxium and Microgaming, two of the most leading software providers that supply award winning gaming software to online operators. The slot features innovative gameplay and stunning 3D Graphics which instantly bring the slot game to life. Packed with exciting features, this Foxium slot game falls absolutely in sync with its motto of outfoxing the ordinary. Due to the use of cutting edge technology and cinematic visuals, Foxium powered slots and games have quickly become a hot favourite among a wide variety of online gamers ever since 2015, the year of its launch. Apart from offering unmatched game play experience, the games powered by Foxium are compatible to be played seamlessly on a host of devices that include iOS, Android and Windows devices. The Great Albini Slot game is all set to take the audience on a whirlwind of magic and illusion with the flick of Mr. Albini's scepter! Notwithstanding the bet level of a player, this magical slot powered by Foxium and Microgaming is a medium variance slot and extends a generous RTP of 96.6% to the ardent gamers. This online slot game comes in an HTML5 format which enables it to run across a host of desktop and mobile devices in portrait as well as landscape mode. Give the Great Albini slot game a spin to add a little magic to your life along with entertainment and fun galore. Also, for the convenience of our players, a list of all the casinos has been given below for you to play this game for real money. Please enter your review for the The Great Albini Slot.